A bourbon cask Glenfarclas? Blasphemy! some would shout, and indeed there are not that many cask GFs bottled from an ex-bourbon. Indeed, Glranfarclas is synonomous with sherry maturation, and although you’d never guess this was a GF blind, their spirit is top notch, and works perfectly well with ex-bourbon. I’ve tasted a bourbon cask sample way back when the Glenfarclas Ambassador visited a year ago or so, and it was very impressive. This one is no different as we’re about to see. 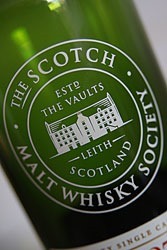 Many thanks to the SMWS for bottling this stuff. Nose: This is a very nice example of ex-bourbon loveliness, and from a Farclas? Nice! starting very fragrant with quite a lot of aromatic wood, coconut, pencil shavings, ripe oranges, some more polished wood (this feels older than it is), Rich honeyed and concentrated, with more orange peel, vanilla, and toffee , a touch of red grapefruit pith too adds a nice balance to the sweet wood and honey. Palate: Spicy sweet chilly on entry, then the citrus fruit shine , with orange marmalade, and candied grapefruit peel, chocolate mousse and toffee, lots of wood spice : cloves, pepper, some ginger and also quite a bit of oak here, some kirsch liquor as well as well as cinnamon sticks. Complex and fun! Finish: Rich chocolate Ganache, ripe cherries, sprinkles of chilly and nuts. An Awesome single cask, and to think we’re missing all this from Farclas when we’re getting only sherry. Guys, you should think about some of those as OBs . 16 year old, 60 % abv, 60 quid (sold out). like.